Much maligned and often misunderstood, for years disco divided music fans. Some connected with the dance grooves. For others, it’s omnipresence from the mid to late ‘70s, the schlock cash-ins by has been artists, and the resultant backlash gave the impression it was a vacuous dance fad. Even though the last twenty years have gone a long way towards rehabilitating the music’s legacy, rarely (in my opinion) is it thought of in its proper context, as cutting edge (for its time) R&B. 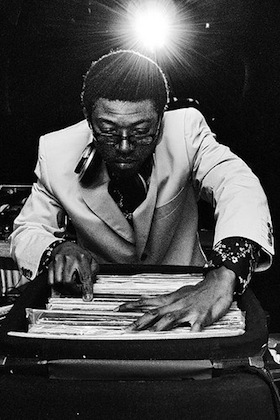 Whether being appropriated by dance music enthusiasts or spat upon by traditionalists, disco’s clear lineage to the early R&B/soul & funk sounds is usually disregarded. So this is my humble attempt, dear reader, to shine a different light on the music, to show that disco is much more than four on the floor beats and lyrics just about dancing the night away. MP3: Frankie Gee :: Date With The Rain — A contender for the title of ‘First Disco Song’ is Eddie Kendrick’s “Date With The Rain.” Containing many of the traits of later disco songs (e.g. four-on-the-floor beat, soaring choruses, etc. ), “Date With The Rain” bridges the gap from soul & funk to the new sound. This particular version is a cover by L.A. artist Frankie Gee. There’s a particular rawness to this track that emphasizes the ‘disco’ characteristics of the tune. MP3: Eddie Kendricks :: Girl, You Need A Change Of Mind — From the same album as “Date With The Rain”, “Girl, You Need A Change Of Mind” is another excellent proto-disco song. For me the great thing about this era is that the connection to soul is still apparent. A new sound could be heard forming but each song was distinct, unlike many of the crass cash-ins that followed later in the decade. MP3: George McCrae :: I Get Lifted — From McCrae’s 1974 LP Rock Your Baby, “I Get Lifted” is an instant classic. Starting with the shuffling drum pattern and syncopated guitar, everything about this song is ‘disco’ and it should come as no surprise. One Harry Casey penned “I Get Lifted.” Casey was a staff writer for Miami based label, TK Records and later found fame as KC from KC and The Sunshine Band. MP3: Sisters Love :: Give Me Your Love — Another song to bridge the gap between soul/funk and disco, “Give Me Your Love” originally appeared on Curtis Mayfield’s soundtrack to the blaxploitation classic, Superfly. Mayfield’s mellow funk love song is given a shot in the arm on the Sisters Love version. Heavy percussion, a faster tempo, and later Danny Krivit edit, insure that this version ALWAYS features in any disco set that I spin. I defy anyone to not dance when it’s on. MP3: Golden Flamingo Orchestra :: The Guardian Angel Is Watching Over Us — Contrary to the popular belief that disco was just about the joys and frivolities in life, some reflected current issues and acted as sort of musical newspapers. One such song is the “The Guardian Angel Is Watching Over Us.” Released on the P&P Records affiliated Golden Flamingo Records, this song sings the praises of the vigilante force known as the Guardian Angels at a time when there was not much support for their activities. Starting with one of the heaviest intros for a disco song that I’ve ever heard (does anyone else hear a slower version of “Radio Clash”? ), “Guardian Angel…” is a disco/funk masterpiece. At a time when the sound of disco had been codified and the deluge of kitschy cash ins was already underway (Ethel Merman disco! ), this song bucked the clichés without sacrificing any danceablility. MP3: New York Community Choir :: I’ll Keep My Light In My Window — I must confess that I’ve only recently become aware of this song through Quantic & Alice Russell’s cover. However, it has quickly become one of my favorites. Originally recorded by Caston & Majors and produced by Chess Records veteran Leonard Caston. Artists such as Maria Muldaur, The Temptations, and the Philip Bailey produced Free Life have covered this song. One of my favorites is from the New York Community Choir. In the 60s and early 70s, gospel/soul and gospel/funk crossovers were the order of the day so in the later 70s, gospel and disco co-mingled. NYCC’s take on “I’ll Keep My Light…” is a fine example of this. MP3: Sun Palace :: Rude Movements – Absolutely crucial to the development of disco were the loft parties of David Mancuso and other underground dance clubs. Before the sound coalesced into a definitive style, the dedicated hedonists that attended these all night parties were interested in whatever grooves made them dance. Although it was released in 1983, “Rude Movements” typifies the freewheeling spirit of those proto-disco parties. MP3: Rim & Kasa :: Love Me For Real – Although it’s thought of as a 1970s phenomenon, disco survived well into the 1980s. “Love Me For Real” is a perfect example of quality 80s disco. All the usual traits are there but it maintains it’s own identity. It never succumbs to the well worn disco clichés but never fails to fill a floor either. Released on the 1982 album ‘Too Tough’, Rim and Kasa’s genre melding Afrocentric disco/funk would not be out of place in the formative days of disco. Excellent selections all around. The Eddie Kendricks record referenced in the first couple of tracks (…People Hold On) is really worth tracking down. Sun Palace is killing me…. All night long. Thank you AD and CC. Nice! Can’t wait to snag this shiznit! “It’s not What You Got” and “Going Up In Smoke” are two full blown disco tracks recorded by Kendricks with relevant social messages that go much deeper than dancing all night. If you listen to “Going Up In Smoke” and “He’s A Friend”, for that matter, you’ll realize that Eddie Kendricks was doing Kirk Franklin type contemporary gospel music long before Kirk, the Winans, and a lot of other groups.